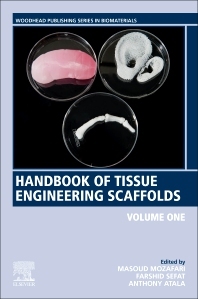 Handbook of Tissue Engineering Scaffolds: Volume One, provides a comprehensive and authoritative review on recent advancements in the application and use of composite scaffolds in tissue engineering. Chapters focus on specific tissue/organ (mostly on the structure and anatomy), the materials used for treatment, natural composite scaffolds, synthetic composite scaffolds, fabrication techniques, innovative materials and approaches for scaffolds preparation, host response to the scaffolds, challenges and future perspectives, and more. Bringing all the information together in one major reference, the authors systematically review and summarize recent research findings, thus providing an in-depth understanding of scaffold use in different body systems. Farshid Sefat is a Programme Leader/Assistant Professor in Tissue Engineering at the University of Bradford (UK) and Polymer Interdisciplinary Research Centre (Polymer IRC, UK). Previously he was Head of Biomedical Engineering Department at King Faisal University (Saudi Arabia) and Visiting Professor at Stevens Institute of Technology (New Jersey, USA). He completed his post-doctorate research assistant at the University of Sheffield (UK) in the area of corneal tissue engineering. He received his PhD (2011) and BEng. (2005) degrees in Biomedical Engineering both from the University of Bradford (UK). He also obtained his MSc. (2006) in Biomedical Engineering (Cell and Tissue Engineering) from Keele University, (UK). His research is based on developing biomaterials to control cellular behaviour with particular emphasis in developing engineered materials for tissue engineering. Programme Leader/Assistant Professor in Tissue Engineering at the University of Bradford (UK) and Polymer Interdisciplinary Research Centre (Polymer IRC, UK). Anthony Atala is the Director of the Wake Forest Institute for Regenerative Medicine, and the W.H. Boyce Professor and Chair of the Department of Urology at Wake Forest University. Dr. Atala is a practicing surgeon and a researcher in the area of regenerative medicine. His current work focuses on growing new human cells, tissues and organs. Dr. Atala works with several journals and serves in various roles, including Editor-in-Chief of Stem Cells- Translational Medicine, Current Stem Cell Research and Therapy, and Therapeutic Advances in Urology; as Associate Editor of Tissue Engineering and Regenerative Medicine, Rejuvenation Research, and Gene Therapy and Regulation; as Executive Board Member or Section Editor of the International Journal of Artificial Organs, Organogenesis, and Current Urology Reports; and as Editorial Board member of Expert Opinion on Biological Therapy, Biomedical Materials, Journal of Tissue Science and Engineering, 3D Printing and Additive Manufacturing, Technology, the Journal of Urology, Recent Patents on Regenerative Medicine, BioMed Central-Urology, Urology, and Current Transplantation Reports. Dr. Atala is a recipient of many awards, including the US Congress funded Christopher Columbus Foundation Award, bestowed on a living American who is currently working on a discovery that will significantly affect society, the World Technology Award in Health and Medicine, presented to individuals achieving significant and lasting progress, the Samuel D. Gross Prize, awarded every 5 years to a national leading surgical researcher by the Philadelphia Academy of Surgery, the Barringer Medal from the American Association of Genitourinary Surgeons for distinguished accomplishments, the Gold Cystoscope award from the American Urological Association for advances in the field, the Ramon Guiteras Award for pioneering research in regenerative medicine and outstanding contributions as a scholar and teacher, the Innovation Award from the Society of Manufacturing Engineers for the creation of synthetic organs, and the Rocovich Gold Medal, awarded to a distinguished scientist who has made a major impact on science toward the understanding of human disease. In 2011 he was elected to the Institute of Medicine of the National Academy of Sciences.